Hello Folks! Welcome to this special Monday on Songbird. Today I am joining up with a team of the most creative women in blogland. They all have that magic touch to turn trash into treasure, or junk into jewels. My project for our special event was kind of a treasure to trash to treasure project. But it all turned out in the end. If you are here for the first time. My name is Marianne aka Songbird. I love to decorate my nest, paint things white and learn new things while I DIY myself through life. If you’d like to get a feel for my style. You can find my decorating projects in my I ♥ to Decorate Gallery and my craft projects in my I ♥ to craft gallery. DIY projects I have done are of course in my I ♥ to DIY gallery. Two crochet pillows, that are just looking so perfect on my couch. Just adding that perfect touch of vintage to our rather modern sofa. They didn’t start their lives as pillows. Someone spent a lot of hours crocheting a wonderfully huge bedspread made up of a gazillion grannies. Then I found that spread at a flea market. It was a lucky find and as soon as I had discovered it and was eyeing its beauty, the vultures moved in, I had to think and move quickly because my fellow flea marketing women are no easy push-overs. So I did my negotiating fast and furious and went home basking in the glory of my new found treasure. Back home, that treasure turned out to be somewhat of a surprise. As I inspected it, it turned out there were a lot of holes, that could be patched, but still…. Then I discovered some stains, that my instinct told me would not come out easily….. But than I put my thinking cap on. What if…. If this blanket was already damaged I could do no harm cutting it up even more…. There were plenty of good and salvageable parts in this rather huge blanket…..
And out came the sewing machine. And here they are. Two crochet pillow cases made from a handmade vintage bed spread. From treasure to trash to treasure again in a few hours. Not a bad junker’s save, if I say so myself. Want to have some like that too? That can be arranged, just keep reading…. But first things first. My junking friends have cooked up some awesome projects. I have seen some sneak peaks and boy-oh-boy did they deliver some awesomeness. And now back to you getting these pillows into your own home. You are in luck today because I am giving a set away. Yep, two pillow cases handmade by yours truly, with the help of an unknown chrocheter somewhere in France, are up for grabs. You have several options to win. Just click on the gadget below and choose any or all ways of entry. Winner will be announced in a week. But if you feel like your luck might be running out, and you still really want to have these pillows. There is another option. That bedspread was huge and I can easily make a couple more of these pillows. So I have listed them in my shop too. If you want to be absolutely sure you that you will get yourself a pair, buy them in my shop SongbirdsNest. Okay. Are you inspired? Got some junk of your own to share. Well today is the day for you. We are having a link party. And all of us Junkers United will be sharing, and liking and pinning our favorite projects from the party uplinks. So come join us in the Linky Party and Get Pinned. We'd love to see YOUR junk! Link up your favorite 3 posts and we'll pin highlights into one of the 4 boards shown below! Visit them regularly, we add daily! Marianne, only you can make a tablecloth into a working wonder. These pillows are signature you all the way and are outstandingly gorgeous! Pottery Barn, hands off! This girl’s got it! Stunning project! Beautiful and they have a hip vibe–not grandma! Marianne your pillows are gorgeous! Great job and excellent save! 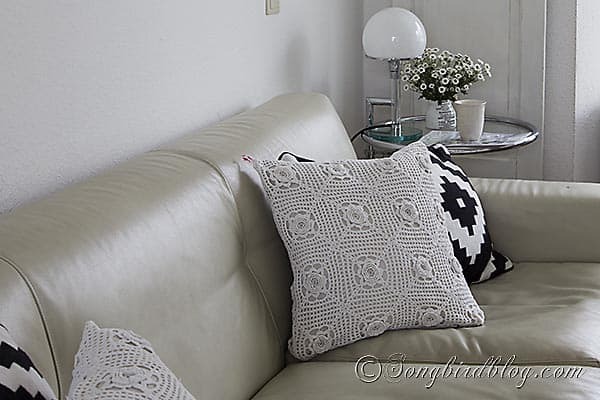 The crocheted rose pattern from the spread really make these pillows beautiful! I see you are giving them away. I would have separation anxiety! I would love to see these in my guest room! Seriously not your gramma’s granny squares. These are just so beautiful. 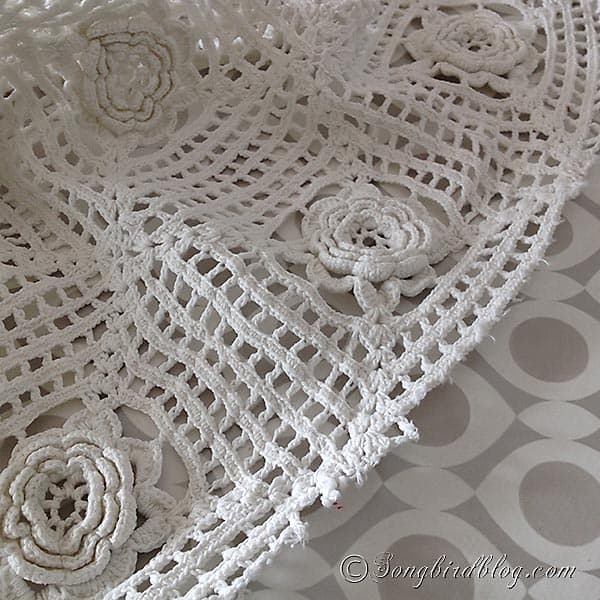 AND they remind me of my mother – not because she crochets (which she does) but because she collects crocheted doilies and dresser scarves and such. Beautiful! She would love these too! I h ave the perfect set of pillows to use these one in my living room! What a great save of a castoff – so pretty – I love the details! I love those pillows, what a brilliant idea! these are sooo pretty!! I would use them on my couch! I hope I win!! I love how you upcycled the vintage tablecloth and gave it a whole new purpose. Your pillows are beautiful and who wouldn’t want to win a set. I sure would…. fingers and toes crossed for luck!!! Love your blog. These are just beautiful, Marianne, and such a lovely way to salvage a pretty old blanket! Beautiful! They would look lovely on my couch or guest room bed! They are quite lovely! What a generous idea to share your treasure! I am sure the person who made these would be pleased with what you have done. The bedspread was used and loved and now her handiwork is being admired in another way! Fantastic idea! I would love to redo our bedroom and put them in there!! My mom was a crochet-er and grannie square maker. I have lots of her items and never thought of making any of it into pillows, probably because sewing doesn’t come easy for me. So instead most of the things are stuck in a closet. Your idea is so much better, and so pretty. Lovely save. I always love how a person can take something that is not exactly right and turn it into a definite win. I would love to have a pair of those lovely pillows on my couch as well. They could join the two I made from my husbands worn out sweaters. These are awesome! I have an old bed spread that could use a new life 🙂 fantastic idea!! Great way to use your bed spread, I need to get the sewing machine out myself. Im in need of some spring pillows! Thanks for the ideas. This pillows would also look great dyed some funky color for a teenagers room!!!! These are so beautiful! I have a stained and slightly damaged crochet blanket that I need to turn into pillows- thanks for the inspiration! Oh I love these pillows. I would use them in my living room. They would go so well there. Thanks for the chance. Lovely giveaway. Have a wonderful day! I would use these gorgeous pillows in my living room. I love them! I Love, Love, Love these pillows!!! I love repurposing things like this! Beautiful pillows! I would use these in my family room! Marianne, the pillows turned out gorgeous! I would have been so disappointed to discovery the unfinished edge, the stains and the holes, but you turned lemons into lemonaide and I am so impressed with your ingenuity and creativeness! Nicely done! Wow Wow Wow I really love those pillows ! I’ll put them in my living room ! I would put them in my bedroom ! Wonderful pillows, I am a big sucker when it comes picking up handmade stitch work anything that I stumble across at yard sales, thrift stores, or what have you. To me they need a proper home with all the love and hard work that was put into them! I love to see them put to good use! These would go fab in my daughters girly vintage inspired bedroom on her bed…. All of the hosts have had wonderful projects and I have really enjoyed hopping along…. now I get to see more eye candy with all the link ups… YAY! I have been in junkers heaven today, and theres more to come…. GREAT party! The pillows are beautiful, I have a Maxwell sofa in dark leather that I think they will look amazing on. You did such a wonderful job. Thank you for sharing. Beautiful pillows! I’d use them on my bed! Ik heb een mooie sprei die ooit in noeste arbeid door mijn moeder gehaakt is. Helaas houdt mijn vriend er niet zo van, hij ligt op een kast zodat ik er toch van kan genieten. De rafflecopter is niet zo mijn ding, ik heb er altijd ruzie mee. Mag ik zo mee doen? I’ll put them in my living room they look so elegant !! I love how you mixed the vintage with the modern! These would go perfectly with my yellow and gray bedroom set and add a touch of vintage to my modern room. Thank you for the chance to win them! Beautiful pillows! I’d use them in my bed room ! Beautiful pillows! They would look great in my bedroom, maybe my living room on the couch! Marianne your pillows are gorgeous! Great job! in my bed room ! I love the pillows. I did the same thing with an old chenelle bedspread that I found. Love those pillows!! Would use them on bed in the guest bedroom. I just found a bunch of old doilies at the thrift store and this is what I’m going to do with some of them. Thank you. Love them so much hope I can win !! in the living room ! !! thank you for the chance and I’ll put them in my living room !! I love the crochet work !! hope I can win to give this lovely pillows set for my Mom in mother’s day !! I love this kind of hand made work it looks so elegant !! my grand mother did a lot this work when she was young ! hope I can win this pair of pillow to put them in my living room ! I would love to win those two beautiful pillows! I would use them on my guest bed. I love crocheted items, I have a bedspread on my guest bed that my great aunt made me about 25 years ago and I adore it. Great job Marianne, so very clever & super creative!!! They would look so adorable as accent pillows on our bed in our new coastal cottage master bedroom! I’m not much of a seamstress….sure I could figure it out!!! beautiful !!!! I WOULD HAVE TO USE THESE ON MY BED they are so gorgeous! thank you for the chance at winning them! Beautiful! I think these would end up either on my bed or on some chairs in my living room… hard to say! I would use them in my bedroom! Gorgeous! In my guest room they would make a lovely addition.